I love cat leaps. The feeling of jumping a large gap and landing with nothing but your fingertips between you and the ground really gets my heart pumping. 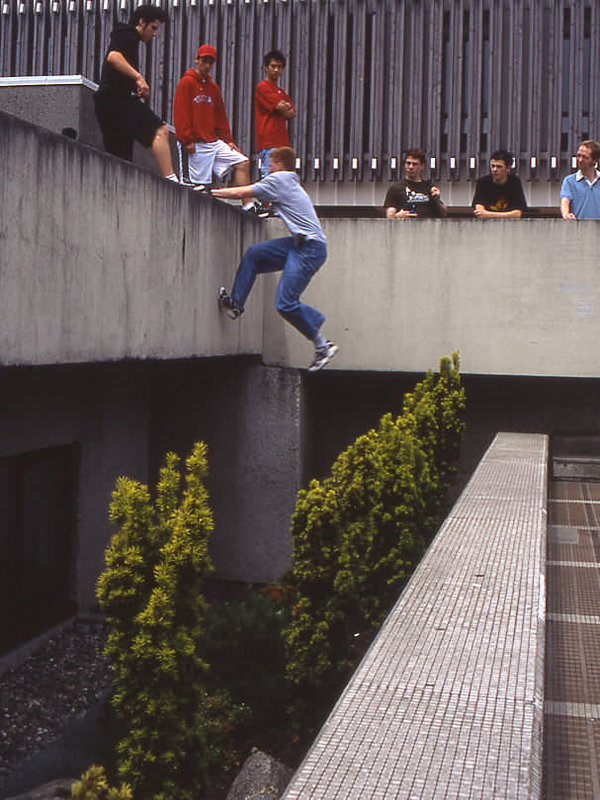 That said, they are also one of the most committing moves you can do in Parkour. 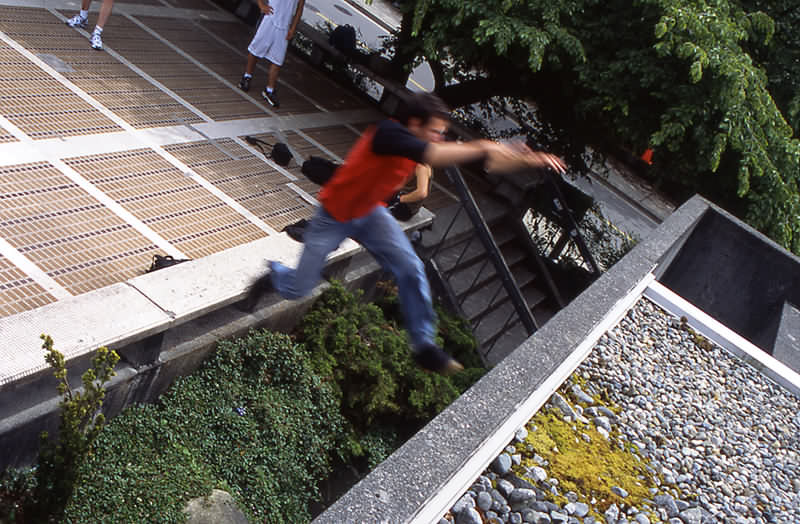 Unlike other PK moves, where a “miss” usually presents itself with other options to avoid injury, a missed cat leap can only mean certain falling. 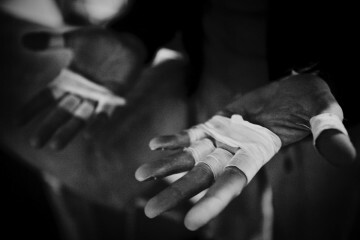 Being a climber, I feel quite comfortable with only my fingertips wrapped over a positive cement edge. In the world of climbing such an edge is called a jug, an easy hold that you could grasp all day. However in the world of cat leaps, your feet play as much of an important role as your hands. This may not be intuitive to most, but it’s time everyone realize that you absolutely MUST kick the wall! A good wall kick will prevent your body from slamming into the wall. And if there is nothing to kick, then what the hell are you trying to do? This isn’t the parallel bars. Running, grabbing, and holding onto a round bar while you swing under it is much much different than doing the same on a flat cement lip. Out of the four serious injuries that I can recall, two of them were cat leaps with difficult wall-kicking conditions. On one, you had to kick a slippery telephone pole, and the other required you get your feet up quite high to contact the wall. 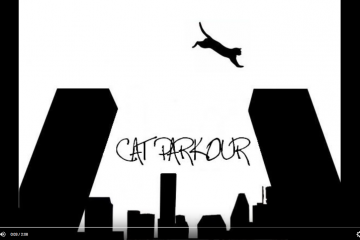 It’s the latter cat leap that resulted in the a serious head injury, scared the living bejesus out of me, and prompted me into writing this article with the hope of preventing any future nastiness. Enter DrunkMonk. DrunkMonk is not your average traceur. 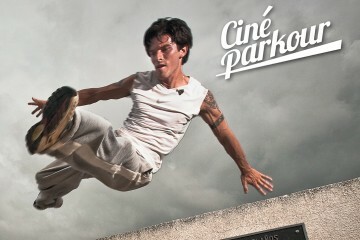 He is very skilled in Parkour, a black belt Kung Fu master, a talented skater… basically your all around urban ninja. So to say that he didn’t know about the “kick the wall” rule would be insulting to both his intelligence and yours. He knows what he’s doing. However on one particular night, a simple matter of misjudgment meant the difference between a successful cat leap and serious head injury bordering on brain damage. DrunkMonk, joined by friend DimMonk, were visiting from Montreal and I had had the pleasure of showing them around the city. On the eve of Aug 22nd, the three of us headed to the UBC campus to scope out it’s PK potential. I had a few spots in mind, and after a quick warm-up running the rooftops of the Buchanan building, the happy trio headed over to Koerner Pub for the famed cat leap from PKCA4. Being dark outside, I wasn’t in the mood for attempting it myself, so I left it up to the judgment of DimMonk and DrunkMonk to decide if they wanted to give it a go. Dim was out, but Drunk figured he would give it a shot…without running. I’ve only ever seen it down from a run, but the gap isn’t any larger than I’ve seen Drunk static jump in the past. The issue of most importance however, isn’t the distance of the jump, but that the wall is only 4ft in height. That means you must hit the lip with enough height to get a foot on the wall (see the photo of Kona for a perfect example). I’m not sure what Drunk was thinking. Perhaps he thought that he’d only need to get a knee up, or that his torso would prevent him from swinging underneath. In any case, the end result is one trip to the ER. He fell directly onto his head, narrowly missing a large rock, and hitting a metal grate instead. The fall gave him a nice gash, knocked his brain around, and caused internal hemorrhaging in the frontal area of his skull. He still can’t remember the event and the 6 hours he spent in the hospital. The next day he awoke with pain in his upper arm, it hurt to touch or even blow on. After another visit to the hospital the doctor determined that there was nothing wrong with his arm, but that the bleeding in the front of his brain was sending his nervous system false signals. Fascinating, but not at all cool. 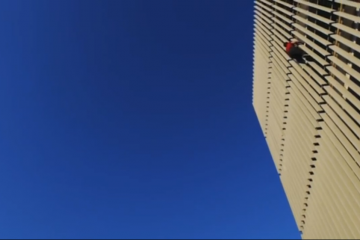 The experience makes for the scariest moment I’ve witnessed in Parkour. 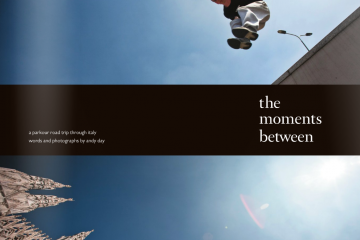 It changed my attitude towards PK and buildering a bit. Yes we are “playing” in an urban environment, but we should be focused about our “play”, training and honing our abilities so that our minds are in harmony with our physical abilities. Eventually we push ourselves to a level where there is little to no room for error, so we must do everything in our power to minimize the chances of that error.